Admittedly, this will be a shameless plug, but it’s still worth sharing. Origami isn’t my only love; my hobbies and interests are varied and sometimes pretty weird. My degree is in graphic design, and when I’m at work, I’m building websites. Outside of work, you have to make time for fun side projects that satisfy any artistic needs that aren’t being met by coding stuff. Being friends with a lot of musicians means I often have someone in need of a design or a site. I’m currently trying really hard to raise enough money to print some tshirts with a recent design I did. I can’t tell you the number of times I’ve come up with multi-color designs that got nixed once people realized the cost, so the potential for actually being able to make it happen is exciting for me. 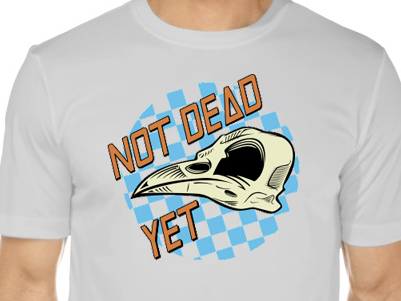 So go check out the two merch items I have available for Not Dead Yet, and feel free to buy! To hear the music (and/or buy a digital copy of their first album), go to https://notdeadyetwi.bandcamp.com/releases. When guitarist, Chris, is writing songs, it’s always clear to me that those songs are OC punk inspired (think D.I., Social Distortion, Adolescents, etc. ), so I wanted to brand them in a way that represents their music. I wanted to create a rad sticker that looks like something you would have seen on a skateboard in Orange County in the 80’s that maybe reminds people of Santa Cruz or Powell Peralta/Bones Brigade. I might be dating myself, and that’s okay. My only hope is that some people recognize my direction, and at least a couple people have already. I illustrated a crow skull because ancient Celtics believed that the crow was a bringer of death, a bad omen when sighted. They had a respectful fear for the crow. The guys named their band Not Dead Yet because conversationally, it became clear that they all felt like they were getting older, but they’re still kickin’. 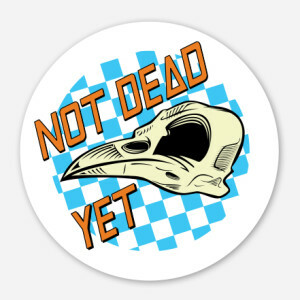 The stickers are also available at Sticker Mule although cheaper, while supplies last, at Not Dead Yet’s site.